The OM-CP-OCTPRO Logger is an all-in-one solution for applications that require immediate analysis. Equipped with eight input channels, the OCTPRO can simultaneously measure current, voltage, temperature and pulse, providing users with real-time data at a moment’s notice. 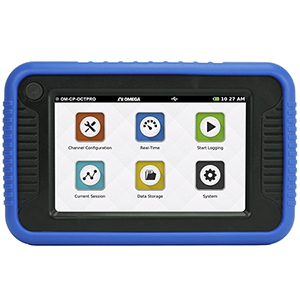 There’s no need for a PC, users can view all data in tabular or graph form on the 5” touch screen, full-color display. OM-CP-OCTPRO Logger Highlight Versatility makes OM-CP-OCTPRO the perfect companion for industrial engineers, quality assurance professionals, compliance officers or automotive technicians. The OM-CP-OCTPRO is very easy to use and configure via the built in capacitive touchscreen graphic display. •	At room temperature (25 °C ±10 °C) after 60 minute warm-up period. •	Temperature calibrated accuracy is thermocouple dependent. WARNING: Battery may explode or fire if mistreated. Do not disassemble or dispose of in fire. Do not charge except specified with charging condition. Do not heat above 212 °F, or short circuit. Do not crush or modify. All channels will use the same reading rate. Reading rates will be capped at 4 Hz when a temperature channel is selected.